Home About Us What is community healthcare? Ease the burden on primary care (GP practices) and secondary care (hospitals). Our dedicated staff see patients in their place of residence or in clinics around the city. Most of our patients will have been referred to us by their GP or another healthcare professional. 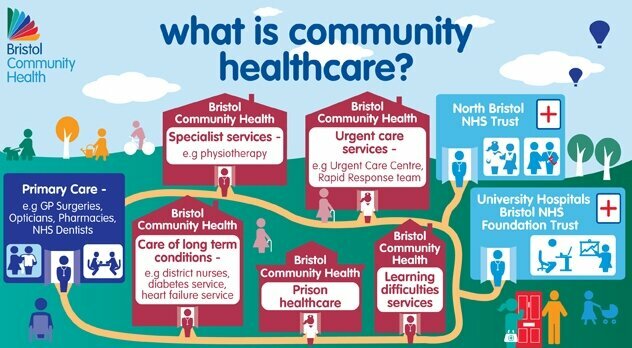 We work closely with other local health partners, for example, University Hospitals Bristol NHS Foundation Trust (which runs the Bristol Royal Infirmary), North Bristol NHS Trust (which runs Southmead hospital) and all of the city’s GP practices, to provide a seamless service to patients. What difference does community healthcare make? Because of the nature of our work, our services make a positive social impact in the city of Bristol, in addition to the direct value of the care that we provide. For example, many of our patients are older people or have long term conditions. They may find it difficult to leave their homes and this results in isolation and loneliness. Our staff visit regularly to provide healthcare, friendly human contact, care and compassion, as well as introducing patients to sources of support from a wide range of voluntary sector organisations. And, our volunteers work alongside healthcare professionals to provide additional support to patients.